Have you ever encountered a film so aggravatingly and aggressively unfunny that it actually causes you pain in the jaw area, from you not moving it even for a slight smirk? That was my experience watching Life of the Party, a movie I found to be so without joy and laughter that it legitimately hurt the muscles around my mouth, which desperately wanted to form the shape of a smile even for a second, but everything that I was watching on the screen was so bad and, again, just the antithesis of comedy, that it was preventing my facial muscles from doing exactly that, leaving me with not just an aching jaw but a sense of anger that this is a movie I had to watch in any capacity. For the love of God, can Melissa McCarthy PLEASE stop writing her own material; and the same goes for Ben Falcone, her real-life husband, who so far has directed and co-written three films starring his wife, Tammy, The Boss and now Life of the Party, and to say that they have all underutilised McCarthy’s genuine comedic and acting talents would make it the understatement of the decade. This movie, however, of the three that they have made together, is by far the worst, the most difficult and painful to sit through, and certainly the least qualified to raise any kind of chuckle from the audience. Make no mistake, this movie is really, REALLY bad, in pretty much every capacity you can think of, and for the rest of the year I will be hard-pressed to find a comedy that left me with as much pain as this movie did. McCarthy, of course, stars in the film as Deanna, a middle-aged housewife whose world is rocked when her husband (Matt Walsh, one of many other comedic talents in this film that are completely wasted) announces that he is leaving her for a bitchy realtor (Julie Bowen, in a role that makes you wonder how much of a toll Modern Family has taken on her film choices). Out of the blue, she decides to reenlist in college – and I do mean out of the blue, because this movie is so horribly paced and structured that we are finding this bit of news at the same time as other characters are finding it out – to complete her archaeological degree, after previously dropping out at the request of her former husband. Over the course of a very uneventful set of circumstances (which we will disclose shortly about just how uneventful they really are), she bonds with her college-aged daughter Maddie (Molly Gordon) and her similarly-aged friends, while also working towards getting her degree, and that’s the entire plot. No, seriously, the entire plot is just her working towards her degree, with several episodic laugh-free skits of McCarthy just rambling on and on long after the set-up for a joke has expired, and keeps going with no end in sight. I refuse to call this ad-libbing, because that would imply that some actual thought went into whatever the hell is spewing out of her mouth like verbal diarrhoea, and it just goes on and on and on without anyone telling this character to just shut the hell up. The whole movie is like this, with characters either spending time explaining the joke to us as though we were stupid, or rambling on as though director Falcone doesn’t have the balls to tell them to try and tone it down. Not one of these jokes land, not a single one, and you’re impatiently waiting for the scene to end instead of laughing along with it, because quite frankly counting down the seconds until it reaches the end credits are far more engaging and useful of your time than actually watching this complete and utter wasteland of a comedy. Three films in to his directorial career, Ben Falcone should really take the hint by now that he seriously needs to step up his game, because this movie – more so than either Tammy or The Boss – is shot and edited so clumsily and haphazardly that it’s a miracle that he’s allowed behind a camera in the first place. Scenes will just end, either with a punchline (albeit an incredibly unfunny one) or abruptly without one, while others are set up with no establishing shots or passage of time, so when in one scene a character receives news of a forthcoming event that’s happening in about a week’s time, suddenly in the very next scene it’s the very day that it’s happening, and there’s no transition between the two to mark any kind of time passage. Apparently, “Directing For Dummies” was out on loan from the library when Falcone decided to give this directing thing a try, and he’s been this lazy ever since Tammy, so can someone please order him a load of books on the subject to make sure he actually learns something this time round? But this is a McCarthy joint as much as it is a Falcone one, and both husband and wife are sorely guilty of making a film so reprehensibly unfunny and wasteful of fine comedic talent that it should be criminal. This is their baby through and through, just as Tammy and The Boss were, but what makes this a far worse sit than either one of them is that not only is this movie such a dead zone for comedy, with other comedic actors like Gillian Jacobs, Stephen Root, Heidi Gardner and Chris Parnell sharing the same rotten material as McCarthy does, but we know by now that McCarthy is a really talented actress, both in comedies like Bridesmaids, Spy and This Is 40 (i.e. ones that she did NOT write) and more serious roles like St. Vincent and the forthcoming Can You Ever Forgive Me? which does look like it will be a fantastic showcase for her dramatic chops, yet she continues to undermine herself with her own writing that hints at absolutely none of that. That alone makes this an incredibly infuriating film to watch, because all the while you’re watching this actress die a slow and horrible death on-screen – a scene where she gets serious stage fright is far more uncomfortable to watch than actually funny, because it’s like a doctor using the defibrillator on a corpse, trying desperately to spark some life into it but to no avail – and in the back of your head you know that she can do so much better than this, which is ironically her own goddamn material. She really needs to stop writing her own stuff, and to discourage her husband from thinking he can competently direct, because I’m sure they’re a powerhouse couple in many ways but filmmaking is by far their weakest shared power. I’m not going to lie, this was a rough movie to get through, and I can hardly think of any other comedy since Grimsby that I remember causing me this much physical pain due to it being so aggressively unfunny – though I guess the one nice thing I can say about it is that at least this film didn’t completely and utterly break my very soul like Grimsby did, or come close to doing so like Status Update – and right now, as I type this, I am still fighting off the soreness of my jaw from it not moving once to form any smile or smirk throughout this entire, miserable and lifeless excuse for a Melissa McCarthy “comedy”. 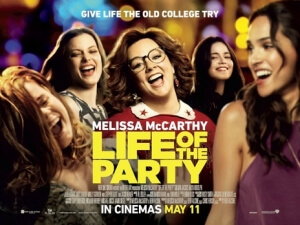 Life of the Party is such an aggressively and aggravatingly unfunny comedy that it can cause actual pain from your mouth muscles not moving once during it, and it completely undermines Melissa McCarthy’s natural talents to a point where it’s just insulting, because you know she can do far better than this lazily written and sloppily directed catastrophe.